Spring greens belong to the Brassica family of green leafy vegetables, and are not dissimilar to kale or collard greens. 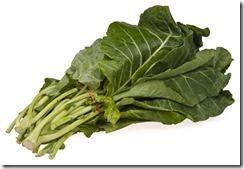 Their best month is March, when they come into season in the UK, and are sold as loose heads of thick green leaves. · Only 26kcal per 100kg. · Very good source of vitamins A, C, K, and folate. · Good source of dietary fibre. · Good source of iron, manganese and calcium. Spring greens are very rich in vitamins A and C that, along with their natural source of sulforaphane, have strong antioxidant properties. People who eat a lot of these types of vegetables have been shown to have lower incidence of both heart disease (through its effect on blood pressure and cholesterol) and cancers. Many fruits and vegetables contain unique compounds called “phytochemicals” that are showing to have strong antioxidant properties. In spring greens, the main compound is sulforaphane, found in many brassicas such as broccoli, Brussel sprouts, and cabbages, and has been researched for its anti-cancer properties. Spring greens are best steamed or stir-fried, after being shredded finely. 3. Add the spring greens and water chestnuts along with the soy sauce and stir until the greens have wilted.